A more crowded online marketplace with less barriers to entry and shoppers who are more comfortable buying from new online retailers make continued growth and maintaining market share more difficult than it has ever been. Growing traffic and increasing new customer acquisition are obvious factors to growth, but managing churn can be easier and have a much bigger impact. Don’t waste time searching out in the internet wilderness, managing churn only requires that you pay attention to the shoppers you already have. Rather than a gamified loyalty structure with intangible incentives like badges, public recognition, or tiered hierarchy, the retailer presents its customers with a straightforward value-based rewards scheme. 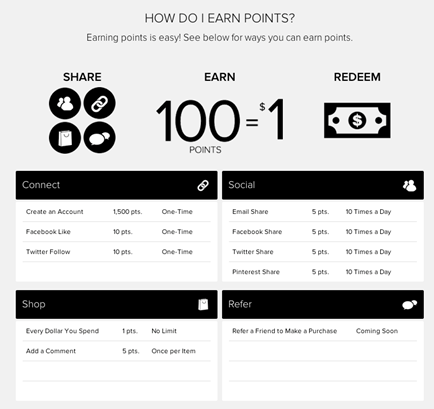 Points are awarded for the value of purchases and for simple actions like referring friends to purchase. Every point translates to a dollar value and can easily be redeemed at checkout. All points are tracked within customers’ My Account experience so they can clearly see how much money they have earned. The retailer’s main goal is growth, but in order for it to sustain growth, it is a necessity to maintain a positive ROI in all of it’s churn management and referral initiatives. By breaking down the monetary outcome of each action available in the loyalty program, it defined the maximum spend for each action, allowing it to create a point structure that would guarantee a positive return. Giving new shoppers and customers a reason to opt into the customer loyalty program is paramount to success. The loyalty program was promoted heavily across its site as well as in its remarketing materials. Within a month of the launch over 5% of their unique visitors were actively participating in the loyalty program. If you have any interest in learning more about how customer loyalty programs can be integrated with referral campaigns, just reach out to info@annexcloud.com. In order for a loyalty program to be successful, the reward must resonate with the customer and the program must be straightforward. Too many restrictions or loopholes is a turn off.